The interior of The Grapevine, a new wine and spirits store that opened at 345 Main St. in Westport. Its grand opening is planned for May 4, 2019. WESTPORT — If The Grapevine was a wine, co-owner Joe Annunziata would describe it as a nebbiolo, an old-school Italian wine that is soft and looks almost fruity but is bold, dry and rustic. The space seems to be symbolic of that. 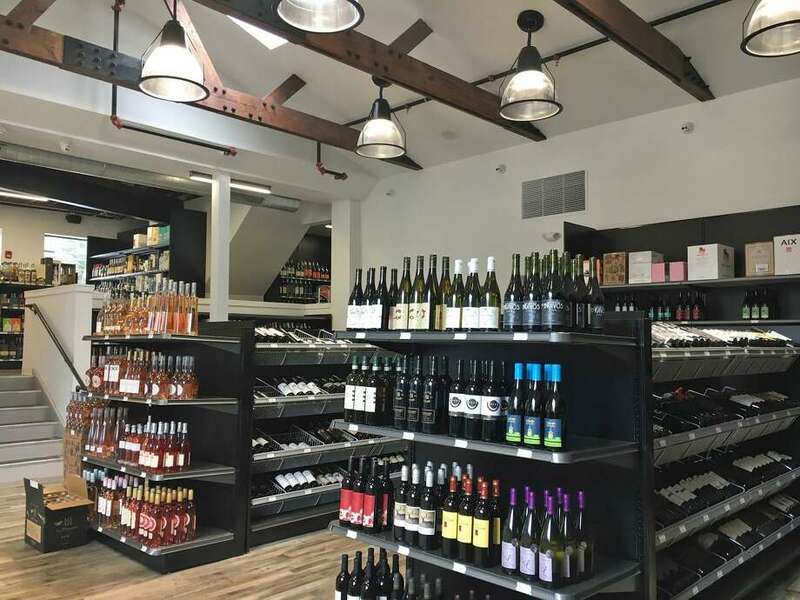 The new wine store, which opened April 4 at 345 Main St., is industrial-like. Its structural rustic trusses, drop-lights and wood floors are met with a bright and open space, equipped with a young staff and a large express check-out. The location was formerly occupied by Crossroads Ace Hardware, which closed last May after 27 years in business. Co-owner Seth Hittman said the influence for the newly designed shop is where the old-world meets the new. Annunziata, who describes himself as a wine geek, has a background in wine. He has worked in the industry in both Fairfield and Westport, and said he is taking his experience and adding a twist, focusing on customer service. The Grapevine will have an email system that caters to a customer’s taste. It will also feature a delivery service and wine cellar filling and upkeep. Annunziata noted that wine’s “stuffy” culture can get intimidating to customers, and said his mission is to educate people about them and push for natural wines that are sustainable without many additives. Although you can find big brands on their shelves, eventually, Annunziata would like the store to specialize in small-batch wine. The reason? Westport, he said, is lacking what every major city like New York City has: a good wine shop that represents independent vineyards and small production wines. The wine store will have its official grand opening on May 4, taking advantage of Cinco de Mayo weekend. It will be accompanied by tequila tasting and Los Poblanos food truck from Norwalk. Looking forward, the duo along with the Westport Downtown Merchants Association, and will be partnering on several events like Fashionably Westport, the Fine Arts Festival and Westoberfest. Hittman said he hopes the wine store will inspire the revival of Westport’s downtown and hopes more business do the same.